This is something that I've always wanted to do but have not because, well, it reminds me of work and I don't want my hobby to feel like work! However, I've been getting a lot of requests to write more about psychology so here we are. The first post in this series looks at the effects that parenting have on child development. Much as we hate to admit it, much of our kids' lives are not in our control. The thing we can try to at least have some amount of control is our parenting. We can attempt to be better parents for our kids (noticed I said "better" and not "perfect"). 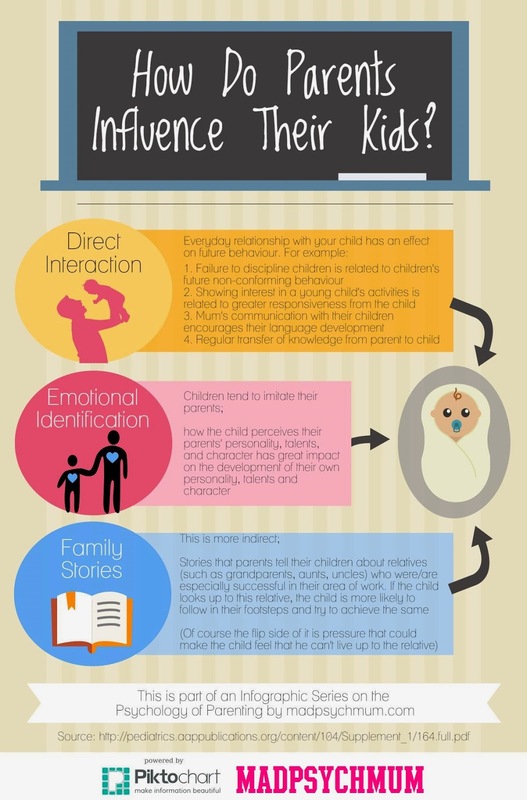 Depending on the age of the child, the influence of parenting will vary. For example, pre-school children tend to be more affected by parenting practices as compared to school-going children, who will be largely influenced by peers and other factors. Of course, this does not discount the fact that a large part of the influence could also be due to genetics but I'm not going to go there because there has always been a big debate about that and no one has an answer. I'd rather focus on what can be changed because unfortunately, we can't really change our genes. Which is why I've decided to put together this series and with the help of my fellow psychologists (thanks guys! ), we're going to bring you various insights to your questions such as "How do I know that my son has autism? ", "How do I help my teenager cope with stress?" and more! If you have questions that you would like to get answers to, please do leave them in the comments and I will try to get answers to them for you (no promises though because we are not omniscient! *laughs*).